Hope your Holiday weekend was great! Wanted to give you some free music, let everyone know what is coming up this week and let ya see some pics from my big trip out west. After traveling so many miles and rushing around for nearly 3 weeks in June to make the trip happen. This song helps me stay grounded and to remember to stop and time to enjoy those around you. And my dad wanted to show off his new acoustic recorder. So this was one take in the back room of my parents house after driving from Denver. This Friday July 9 I will be at The Fillin’ Station downtown Kingston Springs TN! We’ll get things going around 7:30 er 8pm. This will be my first time back in a long time. Had a great time traveling to Montana with Mikhail. We had a ball helping out with Vacation Bible School. And being able to take in all of God’s beauty along the way was amazing. 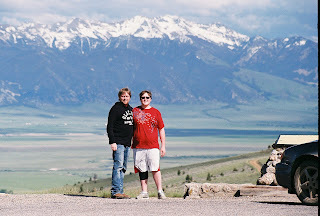 Some of the places we went to: Mount Rushmore, Big Horn Mountains (Wyoming), several Lewis and Clark points of interest, Glacier National Park, Yellowstone National Park and Grand Tetons National Park. Drove about 5000 miles in about 17 days. Hope to have more pictures from the trip by next email. If you’re in Middle Tennessee you need to come to a show this weekend!